Remember that the Tenth Annual 13 Original Colonies event is active. This event a good way to get some activity on your home HF station or even take your mobile station out to see how well it works. This is not a contest but an all mode event to locate and contact as many of the listed Thirteen Original Colonies special event stations. There is also a special event station located in England. They always have a very nice certificate available, if you are interested in such. Here is another On The Air Special Event that you can get your HF as well as 2 meter and 70 cm rigs warmed up for. The National Aeronautics and Space Administration (NASA) is beginning their year long NASA On The Air Special Event beginning December 11, 2017 and will run through December 2018. There will be at least 14 stations operating across the U.S., including the International Space Station (ISS). 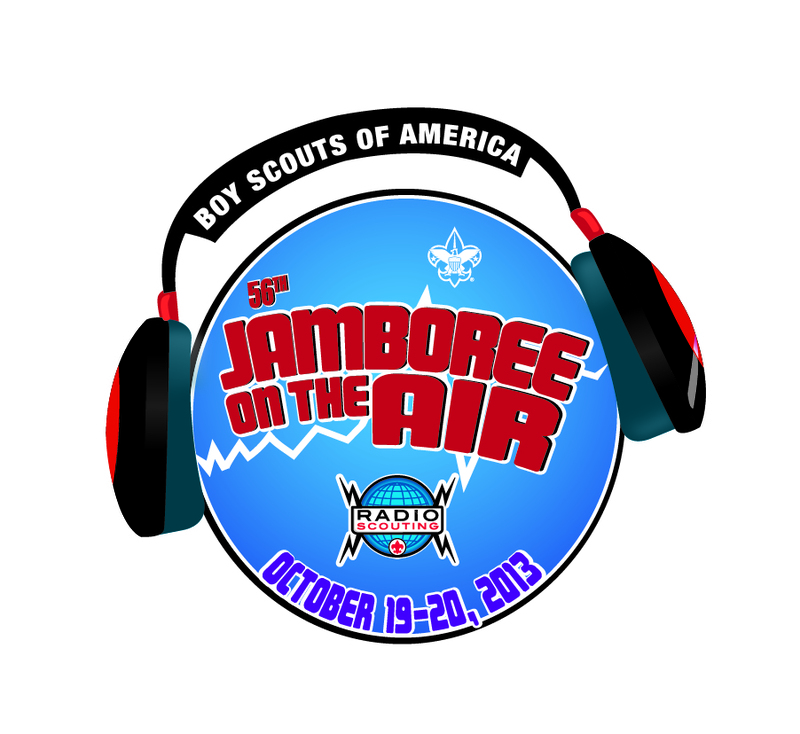 The On The Air Special Events have been well received and no doubt the NASA event will be well received as well. Click on the NASA logo, in this post, for their web page for some interesting reading and images. The wildfire photos, some from the ISS, are awesome! 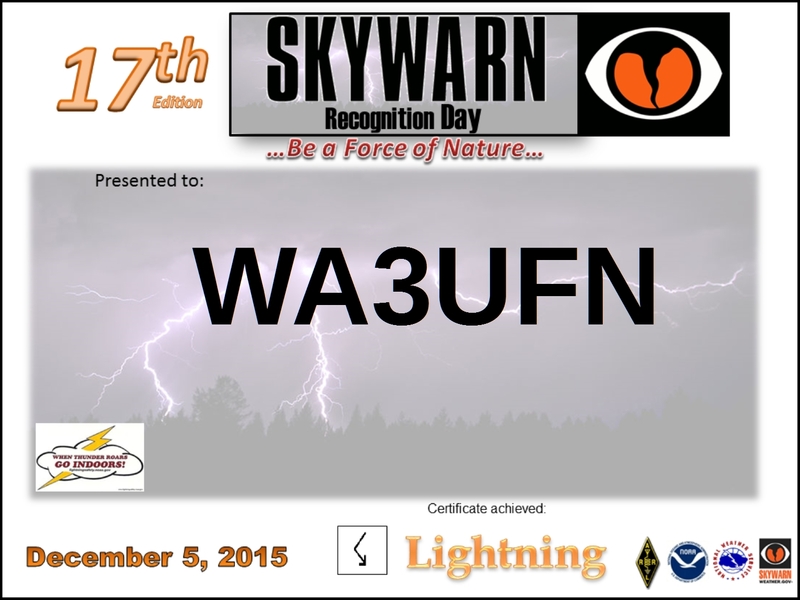 This year the official date for the SkyWarn™ Recognition Day event is December 2. The event will be in operation from 0000 UTC – 2400 UTC, December 2, 2017. This is a rather simple event, the purpose is to contact as many National Weather Service stations as possible on 80 meter – 70cm bands with repeater contacts accepted as well. The contact exchange includes: your call sign, signal report, QTH, and a very brief description of your weather conditions. 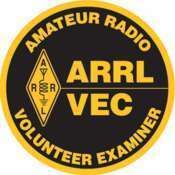 You can print your own certificate at the end of the event, as detailed on the ARRL web site listed below. Clicking on the icon for the NWS office, on the map, will enable you to obtain information such as frequencies and operating times relative that office. Remember to keep a log, or use the handy .pdf checklist that can be found under the RESOURCES heading and click on the SKYWARN™ Recognition Checklist line, on the NWS SkyWarn recognition web-page. Just as a personal side note – this is yet another opportunity to help improve your operating skills whether it relates to everyday operating, contesting, and/or emergency preparedness. 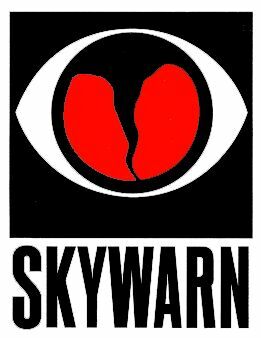 SKYWARN Recognition Day 2018 begins Saturday, December 1 Woo Woo – Another Certificate! 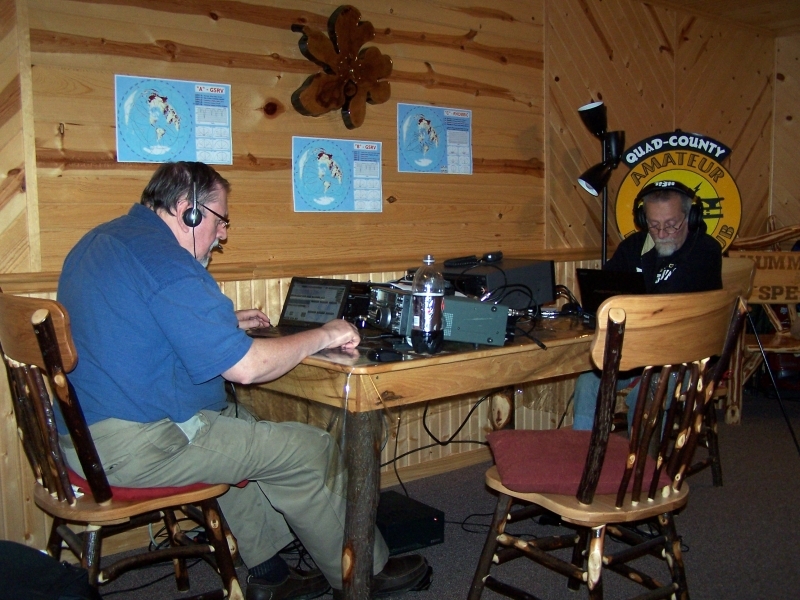 SKYWARN TRAINING – WORTH YOUR TIME Skywarn 2013 QC Hits the Road! 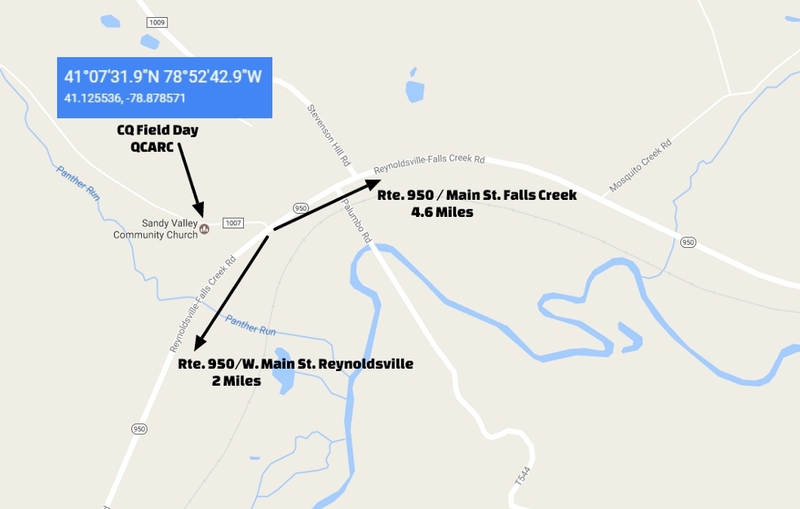 This year the QCARC Field Day site will be at the Sandy Valley Community Church, located just off Rte. 950, between Falls Creek and Reynoldsville. 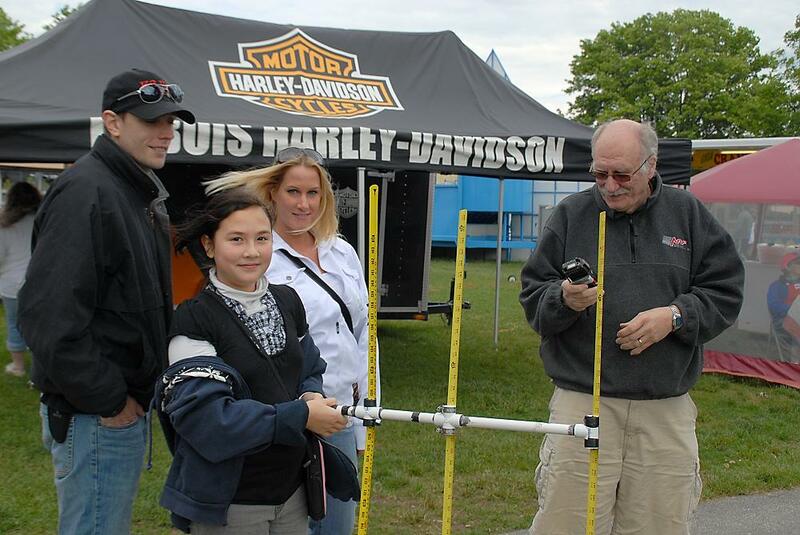 The Quad County Amateur Radio Club will operate Field Day June 25-26, 2016, at the Clearfield County Fairground Community Building, yes we’ve been there before. Operating hours are scheduled to be from 2:00 PM Saturday to 2:00 PM Sunday, antennas have to be installed after the VE exam session. 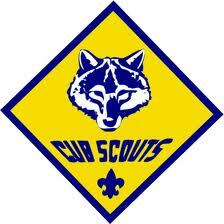 All amateur radio operators are welcome as well as the general public. Since the public as well as a number of Clearfield County officials and TV stations have been invited, as Club secretary, I ask that members please wear their Club shirts if possible. Thank you – in advance. Volunteer examiners are reminded that the exam session is scheduled for June 25, 2016 at 11:00 AM. 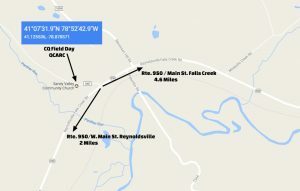 Operations are scheduled to start 2:00 PM, Saturday June 25, continuing through the night, with the hopes of taking advantage of any changing propagation characteristics. There is to be a Get On The Air (GOTA) station activated. 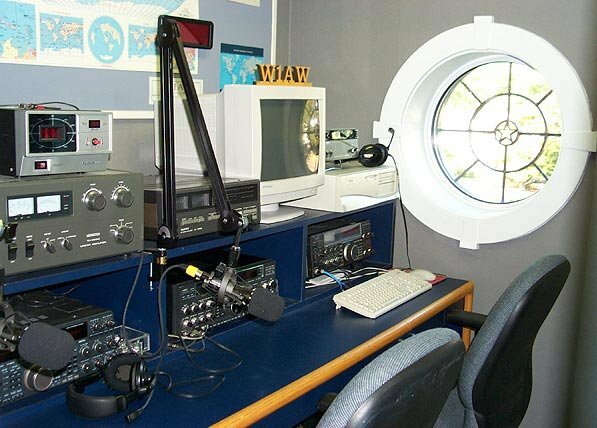 The GOTA station will give new hams and those not even licensed, the opportunity to experience operating the HF bands under the supervision of a licensed amateur radio operator. Location Coordinate information: 41°01.840 N 78°26.540 W.
Follow the route depicted by orange arrows, on the map, after you turn off Rte. 322. You can also try the inserted interactive map to zoom and obtain directions. 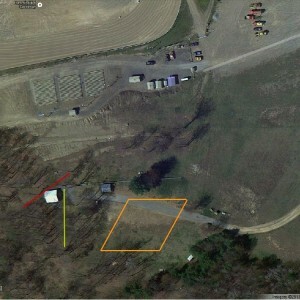 You can use the satellite view on the small map to compare the orange arrow map to the right. 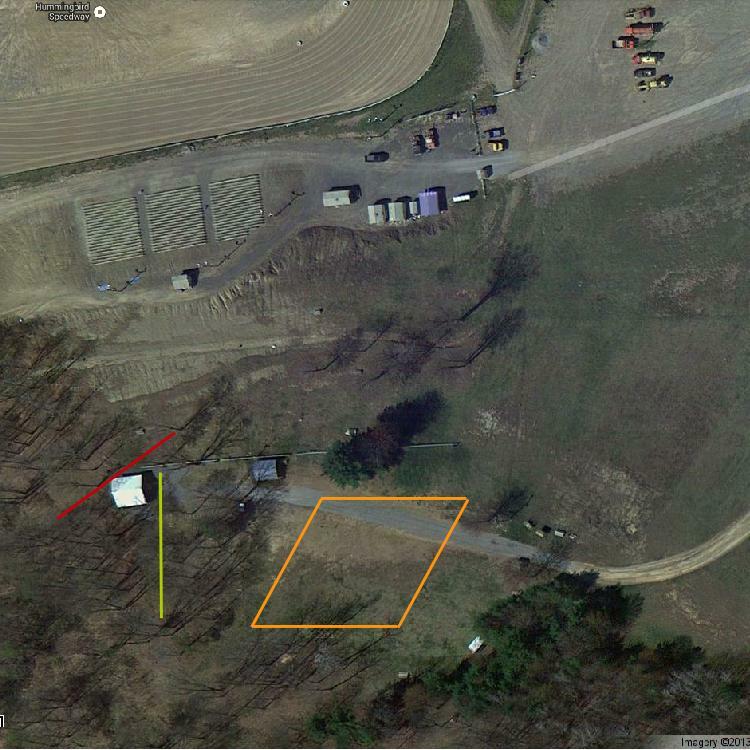 If you operate APRS, there will be an object beacon to help you locate the Field Day site. Please consider what will make Field Day comfortable for you, like in the real deal you will be responsible for your own comfort and personal operating conveniences such as chairs, clipboards, pens, pencils, paper. flashlights, etc. – remember to mark your property -. 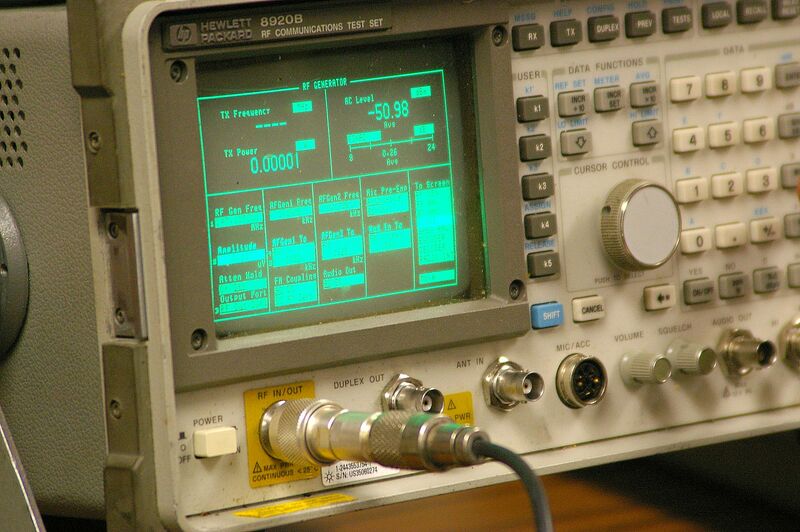 The main equipment will be provided, such as transceivers and antennas. I do not recall that the building is handicapped accessible. If you have a spare HF radio or antenna to bring, all the better as a just in case but only 2 will be on the air plus the GOTA station. 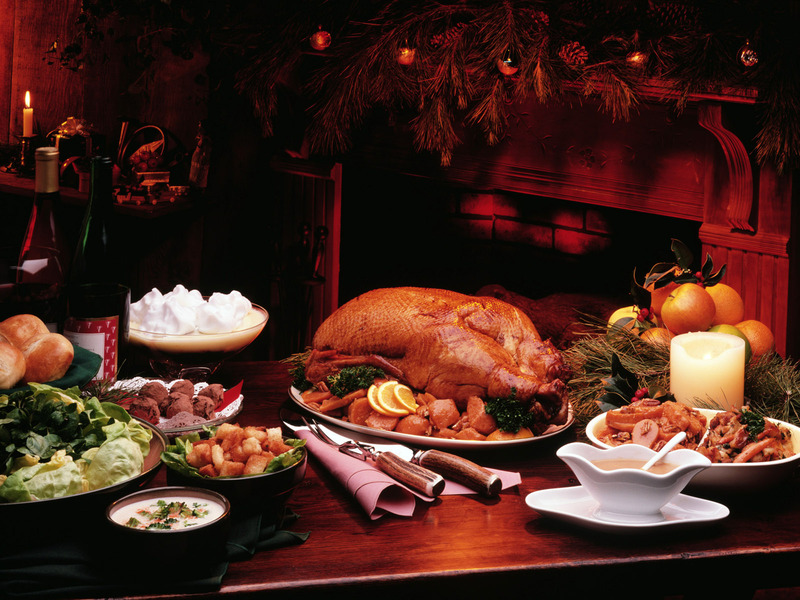 Additionally if possible, please bring along some type of food to share. Plans are in motion to have breakfast Sunday morning and some picnic style food for later times. To help with the items and food for Field Day, please down load the 2 page checklist and email the Club secretary (secretary@qcarc.org) as to the items that you will supply. I’ll try to keep all the updates current on the download list. If you have anything to add, please email your input to the Club secretary. Amateurs who are attending the QCARC Field Day, please advise the FD Coordinator by email at secretary@qcarc.org . This info is for overall planning purposes. 2012 Annual Report N3QC 2012 Contest Scorecard Field Day 2011 See You at Field Day 2012 Get Ready For Field Day! Woo Woo – Another Certificate! SkyWarn Recognition Day has come and gone! I was able to contact 16 stations, for the time that I was on the air band conditions were rather weak not to mention the QSB. For my efforts I was able to print the certificate inserted below. 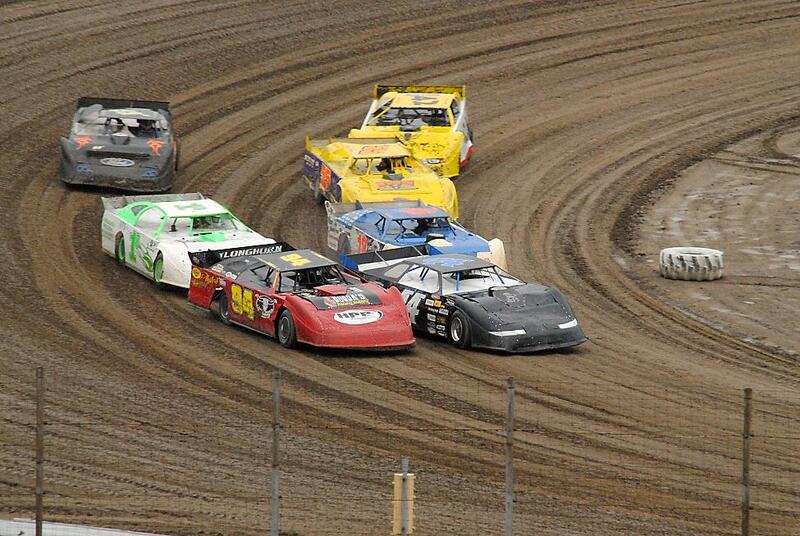 It’s not all that big of a deal but it’s something to show for the effort. 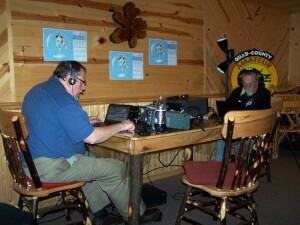 After all, one of the aspects of ham radio is communicating regardless of conditions and it was a National event to participate in. With some of our members being involved in local fire departments, I felt this may b e of special interest. The Pennsylvania National Fire Museum will celebrate its 20th Anniversary, with an on the air special event. As part of its 20th anniversary celebration, the Pennsylvania National Fire Museum , in conjunction with the Harrisburg Radio Amateurs’ Club (HRAC) , will sponsor a special event. The Special Event Station will be on the air on Saturday, Nov. 14, from 8:00 AM to 4:00 PM, and on Sunday, Nov. 15, from noon to 4:00 PM, operating from the museum in Harrisburg. The Pennsylvania National Fire Museum opened on November 17, 1995. Housed in an 1899 Victorian firehouse of the former Reily Hose Company No. 10, the all-volunteer museum features a collection of firefighting artifacts, from hand-drawn equipment to the equipment of today. For more information, contact Richard Lenker, KB3YRC.